Unvented Hot Water Systems are subject to the legal requirements of Building Regulation G3 and can only be installed by a “competent person”. This is regulated to ensure the installation is safe, and that all essential safety components are correctly installed. Below is a Megaflo cylinder showing some of the components of the system. Some may not be required, and this will vary according to the particular installation. Below we explain the purpose and functionality of each the component (some are not shown). 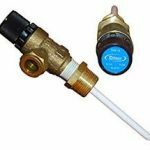 As the name suggests, this contains several components – a filter, a pressure reducing valve and a one-way check valve. 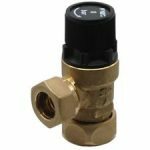 The pressure reducing valve ensures the incoming water pressure does not exceed a pre-set limit – typically 3 bar. This is typically the first component on the mains water supply to the Megaflo. The function of the Pressure Relief Valve is to ensure the pressure within the Megaflo cylinder and pipe work remains within safe limits. If it exceeds this limit (e.g. 6 bar), the valve will open automatically and release the pressure. The water discharge should be visible through the Tundish. Similar to the Pressure Relief Valve, this is designed to release if the cylinder or system pressure exceeds a pre-determined limit (e.g. 10 bar). Additionally, this valve will release if the temperature within the cylinder reaches 90-95C. It is extremely important that the water does not reach 100C. This provides for the mandatory air break within the discharge pipe work. It also enables a visual point of discharge if water is dripping through the discharge pipe. This is a warning signal that something is not quite right, and further investigation should be sought as soon as possible. 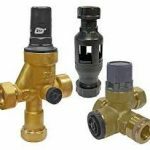 These are required by indirect systems (heated by an external source, such as a gas boiler),and the other zone valve is used for the primary heating circuit. In this example (Megaflo Systemfit), the auto air vent is part of the supplied components. Additional air vents may be required, but these will be specific to each installation. In this example, the circulation pump is used for both the heating circuit and the Megaflo cylinder. All unvented hot water systems need a method to accommodate the hot water expansion. Megaflo cylinders rely on an air bubble at the top of the cylinder; this is created during the commissioning process. 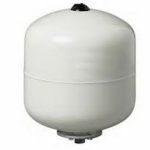 Other manufacturers rely on a separate Expansion Vessel, which is sized to accommodate the total expansion of the hot water system. If no, or insufficient provision has been made for hot water expansion, the pressure may increase to fault conditions and something may be damaged. Please contact Apex Plumbing and Heating on: 01252 311003 or 07810 094803.